Scientists have discovered that thousands of blue lakes of melt water have formed on the surface of Antarctica's glaciers over the past decade, an unprecedented event which threatens the stability of the largest ice mass on Earth. Researchers from the Durham University in the UK analyzed hundreds of satellite images and meteorological observations of Langhovde Glacier, on the coast of East Antarctica's Dronning Maud Land. The study revealed that between 2000 and 2013, about 8,000 new blue lakes have appeared in Antarctica. The scientists suspect that the water of some lakes could seep under the glacier's surface, potentially weakening it and making it more likely to fracture and break apart. Previously it was thought that East Antarctica's ice hadn't been affected by global warming; therefore, more attention has been paid to the changes taking place in the Antarctic Peninsula. It is known that the occurrence of such lakes has led to melting of glaciers in Greenland, where 1 trillion metric tons of ice have melted between 2011 and 2014. In the summer, as air temperatures warm, lakes form on top of the ice sheet and on some glaciers that extend outwards into deep ocean fjords. These lakes can then suddenly disappear all at once, or flow into rivers that drain into the ice below, lubricating the ice and helping increase the rate at which glaciers lurch forward. Sometimes, researchers have even been able to document fresh water flowing outward directly into the sea from the base of a glacier. 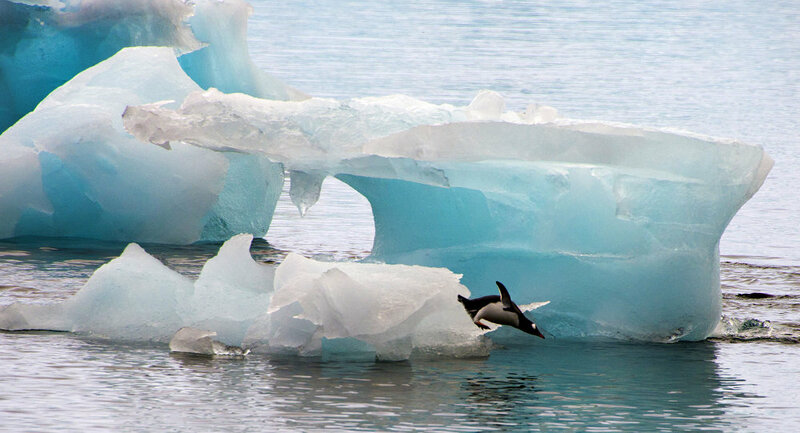 That injection of cold fresh water into salty water can then create tornado-like underwater flow patterns at the submerged glacier front that cause further ice loss. "It's not hitting the glacier really hard at the moment, this process, but of course, as things warm up, we'd expect it to start doing more damage, like we see in Greenland," said Stewart Jamieson, a glaciologist at Durham University and one of the study's authors. The results of the new study were published in Geophysical Research Letters.